Most readers will know Mark Fielding, the chief executive of ISME and be familiar with his relentless fight for small Irish businesses. After 15 years with ISME he is “hanging up his boots”. In September 2016 he completed another successful tour of the country with the ISME Briefing Sessions Autumn 2016. As one of the many speakers who has done the tour with Mark over the year knows, it is a gruelling few weeks. On Saturday 3rd of September Mark spoke to PTMA (Precision Turned Parts Manufacturing Association) at their quarterly meeting on minimising the anticipated impact of Brexit. 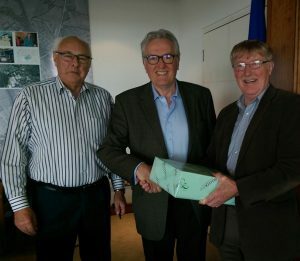 John Devitt (PTMA Treasurer) made a presentation to Mark on day to mark his retirement. As a proud member company of ISME, I would personally like to thank him for his dedication to the SMEs and the Irish business in general. We wish him every success in the future. We also wish Neil McDonnell (General Manager of the Freight Transport Association) every success as the new CEO of ISME.